JAZMYNE ANDERSON TTN Senior middleback Cayleigh Ashman and junior outside hitter Collin Wallace team up against Virginia junior outside hitter Jess Udall in Saturday’s match. The Owls lost, 3-2. 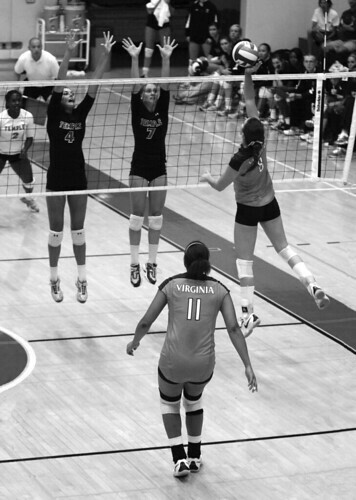 The volleyball team hoped for a better start to its 2010 season. Everything looked good going into Saturday’s matchup with the University of Virginia. With a home-court advantage, the Owls also had seven letter winners and four starters who returned from last season, including senior middle blockers Cayleigh Ashman and Jessica Antosz. Additionally, the Cavaliers went 12-19 last season. That didn’t stop the Owls from being swept at their own tournament. They followed a 3-0 loss to Delaware on Friday with the 3-2 loss to Virginia on Saturday. Against the Cavaliers, the team rallied from a 2-1 deficit to win the fourth match by a score of 25-21. However, the Owls couldn’t rally in the tiebreaker, losing 15-11. Senior outside hitter Ashley Carr led Temple with 15 kills and 49 total attempts. This year, the Owls look to replace two of their stars from last season: Yun Yi Zhang, who led the team and the country with 544 kills last season, and Jackie Morrison, who led the team with 287 digs. The team also looks to improve on their 14-12 overall record and 9-6 Atlantic Ten Conference mark, good for fourth in the league. “But we have two excellent setters in [juniors] Liz Prang and Rikia Trischuk. I think one of the reasons we recruited Rikia was pretty much as a replacement for Jackie. She has the experience, [she] can block the ball just like Jackie can and does a nice job on the offense – attacks real well,” Bertucci added. Prang, a 5-foot-10-inch California native, will need to step up this season if the Owls plan to be successful. She had 44 kills and 103 digs last year. Trischuk is a transfer from Lethbridge College in Alberta, Canada. “I feel real good about having that player to replace Jackie. And Liz is real inspirational – she’s the heart and soul of this group. She’s just great to have on the team, plays any position, not just setter,” Bertucci said. After it lost two talented players in Morrison and Zhang, the team has to somewhat reestablish its identity. The Owls made it to the semifinals of the A-10 tournament last year, falling 3-1 to top-seeded Dayton. They’re picked to finish fifth this year. The women face some tough matches this season, including the Big 5 Tournament, and then go on the road for both the Montana Invitational and Tar Heel Classic. They begin their conference slate on the road against Rhode Island Sept. 24, and at Fordham the following day. They then return to McGonigle Hall Sept. 29 to begin a four-game homestand against the La Salle Explorers. Kurt Hirsch can be reach at kurt.hirsch@temple.edu. Carlin chose to leave Radford for Temple. As more than a typical convenience store, Fu-Wah prepares a killer tofu hoagie.